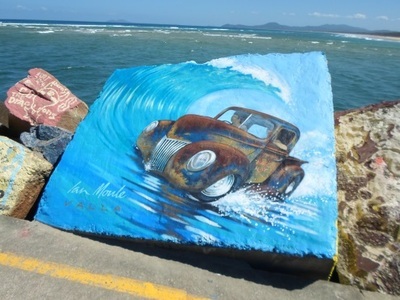 A must-see attraction on any drive along the northern New South Wales coast, the Nambucca V-Wall is a stretch of painted rocks that lies at the mouth of the Nambucca River. 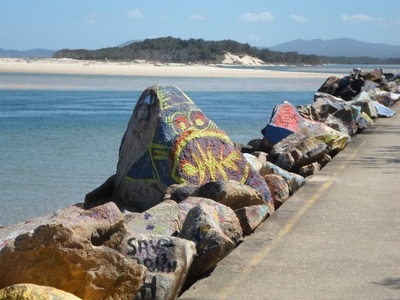 Most of the walk's rocks have been painted by holiday-makers visiting the area, an activity which the Nambucca Shire Council actively encourages. 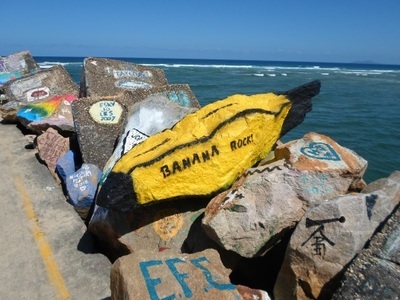 However, you'll be hard-pressed to find a blank rock to leave your own mark on if you do choose to add your own work. Even if you only want to look at the rocks along the walk though, the V-Wall is worth a visit. There are two sections to to explore, beginning on either side of a small beach near the car park (hence the 'v' in the name I guess) and the view of Nambucca River is pretty good from both too. One stretch is particularly sunny though, so remember to bring your hat and wear sunscreen. Other things to do while you're in the area, include taking a dip in the water, or even going fishing. There's plenty of calm water around the attraction (you shouldn't stray too far into the river though, as the currents can get strong) as well as a beach at the end of the longer stretch of the wall. Lots of lookouts can also be found here. For those interested in staying in Nambucca Heads overnight, the White Albatross Holiday Park is one option located right alongside the V-Wall. It offers cabins and camping sites and has its own inland lagoon. However, Nambucca Heads is a relatively large holiday destination (with a population of 11,000) and is quite popular, so there's plenty of accommodation options to choose from. If you're after a quieter place to stay, Scotts Head is located at the other end of Forster Beach. On the way to Nambucca Heads, you can make your drive more interesting by taking advantage of all the attraction along the coastline. The entire stretch between Sydney and Brisbane is known as the Legendary Pacific Coast and Numbucca Heads' V-Wall is just one of the top 20 attractions on the drive, with another being the Australian Reptile Park down near Sydney. 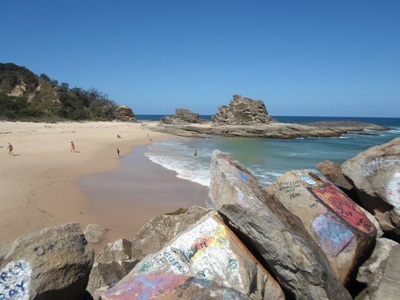 Attractions closer to Nambucca Heads include the Yarrahapinni Lookout at Yarriabini National Park and the Big Banana and Dolphin Marine Magic in Coffs Harbour.